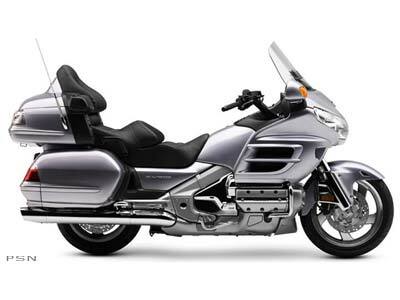 Every fleet has its flagship, and at Honda, this would be the Gold Wing® - where power and luxury converge to create the greatest touring bike ever made. It starts with the 1,832 cubic-centimeter engine, and from there Honda's high-tech wizardry takes long-distance touring comfort and convenience to the max. And for 2009, the innovative Tire Pressure Monitoring System and five new colors take this best-in-class tourer to a whole new level. Handlebar switches and controls use easy-to-understand graphic symbols. Parallel two-valve cylinder-head design utilizes direct shim-under-bucket valve actuation allows the first valve clearance inspection service to be at 32,000 miles. The ECU provides two digital 3-D fuel-injection maps for each cylinder, creating ideal fuel mixture and spark advance settings for superb rideability. Unique knock-control sensors monitor ignition advance to improve performance throughout the entire rpm range. Powerful, fuel-injected 1,832 cc six-cylinder engine produces smooth, effortless power. Touring Convenience Accessories: Removable Saddlebag / Trunk Liner Set (available in standard and deluxe types), Trunk Net, Saddlebag / Trunk Mat Set, Seat Weather Cover, Cycle Cover, Front Nose Mask, Trunk Inner Light, Inner Trunk Pouch, Trunk Lid Organizer, Saddlebag Lid Organizer, Fairing Pouch. Air Management Accessories: Tall Windscreen, Windscreen Side Air Deflectors. Chrome Appearance accessories: Front Fender Ornament, Front Fender Extension, Front Disc Cover, Passenger Floorboard Lower Covers, Side Fairing Accent, Trunk Rack, Front Fender Rail, Saddlebag Scuff Pads, Sidestand, Exhaust Tips (two styles), License-Plate Frame, Swingarm Pivot Covers, Trunk Handle, Rear Spoiler Accent. Specially designed luggage features a remote-control key lock, permitting pop-open rear trunk operation; remote lock / unlock for the trunk and saddlebags; and horn-actuated bike locator. If remote locking is attempted while a lid is open, the emergency lights flash to alert the rider. Instrument cluster includes white-on-black analog displays for speedometer, tachometer, coolant temperature and fuel level, plus features adjustable backlighting and high-luminescence red pointers. Indicator / warning lights are provided for Reverse, Neutral, Overdrive, oil pressure, fuel injection, high beam, sidestand, cruise on, cruise set and low fuel. A high-resolution LCD housed in a separate module is visible in all lighting conditions and displays the odometer, A/B tripmeter, ambient temperature, audio modes, CB, rear-suspension setting, trunk / saddlebag-open indicators and a clock. Five-position heated seat / backrest combination with individual rider and passenger controls for optimum comfort. Six-element speaker system includes two rear speakers, a pair of front speakers and two tweeters for a rich, full sound quality.